PREVENGE is the brilliant and off-the-wall writing and directing debut feature by Alice Lowe (Sightseers). Lowe also leads a strong British cast including Jo Hartley (This Is England, Eddie the Eagle), Gemma Whelan (Game of Thrones), Kate Dickie (Red Road), Kayvan Novak (Fonejacker), Tom Davis (Murder in Successville), Dan Skinner (High-Rise), Tom Meeten (The Ghoul) and Mike Wozniak (Man Down). PREVENGE is produced by Vaughan Sivell, Will Kane and Jen Handorf, a Western Edge production for the Gennaker group. The film will be released by Kaleidoscope Entertainment on February 10th 2017. PREVENGE had it’s world premiere opening Critic’s Week at the Venice Film Festival, since then it has played at a number of key festivals around the world including Toronto, Dinard and London. A pitch black, wryly British comedy, PREVENGE follows Ruth, a pregnant woman on a killing spree that’s as funny as it is vicious. It’s her misanthropic unborn baby dictating Ruth’s actions, holding society responsible for the absence of a father. The child speaks to Ruth from the womb, coaching her to lure and ultimately kill her unsuspecting victims. Struggling with her conscience, loneliness, and a strange strain of prepartum madness, Ruth must ultimately choose between redemption and destruction at the moment of motherhood. 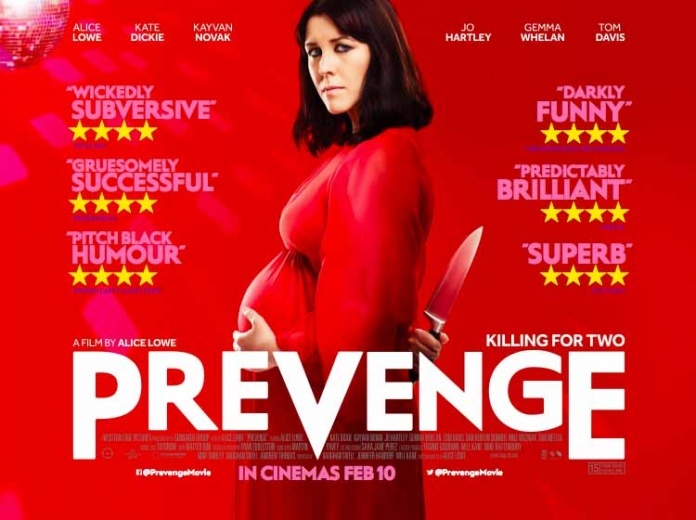 PREVENGE marks the directorial debut from Lowe, who is a true triple threat, writing, directing, and acting in the film during her own real-life pregnancy. Known for her work as a UK television comedy actress, Alice Lowe made her move into film with her screenwriting debut Sightseers, directed by Ben Wheatley, in which she also starred as the hapless Tina. After premiering at Cannes, Sightseers went on to receive several accolades, Empire’s Best British Film, as well as acting and screenplay awards for Alice. Alice’s other work includes three series of her sketch show Alice’s Wunderland for BBC Radio 4, several short films, TV and film appearances such as Garth Marenghi’s Darkplace, Paddington, Hot Fuzz, Horrible Histories, etc. More recently she has starred in UK indie film hits such as Black Mountain Poets, Adult Life Skills and Locke. She often uses improvisation in her work. PREVENGE is Alice’s directorial feature debut. She wrote, starred in, and directed it whilst 7-8 months pregnant with her first child, who also appears in the film. Alice was one of the BIFA nominees for ‘best debut director’.